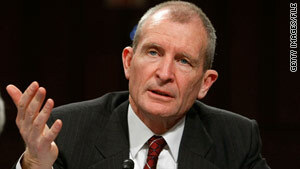 Dennis Blair, U.S. national intelligence director, says, "We're not careless about endangering American lives." U.S. national intelligence chief says, "We take direct action against terrorists"
Washington (CNN) -- The director of U.S. national intelligence said the government has the right to kill Americans abroad if they present a direct threat to U.S. security. The admission from Dennis Blair came Wednesday at a House Intelligence Committee hearing on the annual threat assessment. "We take direct action against terrorists in the intelligence community," Blair told lawmakers at the hearing. "If that direct action -- we think that direct action will involve killing an American, we get specific permission to do that." Blair said the reason he made the admission was to reassure Americans. "We're not careless about endangering American lives as we try to carry out the policies to protect most of the country," he said. Blair went on to say the United States does not target Americans for taking part in free speech, but rather will target them if they threaten other Americans or the United States. Topping the list of such Americans may be Anwar al-Awlaki, currently living in Yemen. Privately, many administration officials said he is one of the next American citizens abroad with whom the U.S. intelligence community wants to deal. Al-Awlaki is a fugitive American-born preacher whom a U.S. counterterrorism official described as a "key associate of al Qaeda in the Arabian Peninsula's top leaders and one of their go-to men for external plotting." Another American security official told CNN that U.S. authorities want al-Awlaki for questioning but denied there is an explicit order to "take him out." U.S. security sources said last month they had concrete and independent confirmation that al-Awlaki had met with Umar Farouk AbdulMutallab, the Nigerian accused in the failed Christmas Day bomb plot aboard a plane heading to Detroit, Michigan. Al-Awlaki has confirmed his contact with U.S. Army Maj. Nidal Hasan, the man accused of shooting and killing 13 people in November at Fort Hood, Texas. If the United States were to take action against American, it would be a decision based on intelligence information that a citizen is posing a threat and must be dealt with, according to Blair. The United States often uses drones to target terrorist suspects, and the special forces have a covert capability to deal with such situations.